While children are always encouraged to create and follow their own path, it’s not uncommon to hear of some choosing the same path their parents began on long ago. Whether it’s as a doctor, police officer, nurse, or teacher, if the kid love what he or she is doing, that is ultimately what matters. 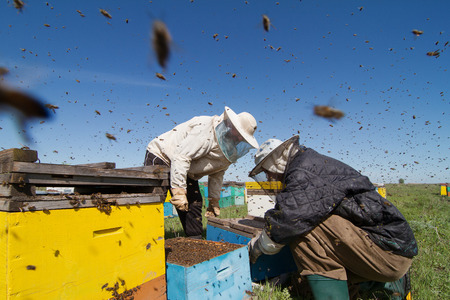 Luckily, for one family out in Lindsay, California, two different generations are discovering their passions are much closer together than they might have guessed—and they involve beekeeping and honey (a lot of honey). As with all apiarists who are true to their craft, the mother and son pair work the beekeeping process from beginning to end—including maintaining the bees’ hives, protecting them from the elements and varroa mites, and extracting amounts of honey that won’t put the bees’ winter supplies at risk. Given their dedication and love for honeybees, even Tyler’s young son Kayden has developed an early interest, stating he wants to follow in his father’s footsteps—just as Tyler followed in his mother’s and great-grandfather’s. The Samples’ brand has developed five total honey varieties, with their buckwheat honey coming in first place in a recent honey festival in California. “The flavor comes from the blossoms—the nectar that they make the honey off of. So, avocado honey is made from avocado trees, [and] orange honey is made from orange trees. The sage honey is made from sage plants. The nectar all taste differently,” Tyler said, with his son calling their sage honey the best they have. Living in California, the Samples have an incredible variety of plants for their bees to forage from, so much so that they likely have very little to worry about in winter. This is especially true when you consider that California is where countless beekeepers from across the country send their hives to not only benefit from almond production but to also protect from winter losses that are so high among honeybee populations these days. In the mere month since they’ve started, the Samples have started selling their honey in stores in four different towns, and they will likely only keep growing from there. More Urban Beekeepers Putting in the Work to Save BeesHow to Make Grilled Salmon Teriyaki!